Epoxy flooring & stained concrete installed in your home or garage floor in Virginia beach, Norfolk and Chesapeake. Please call us for a free consultation and to schedule your free epoxy flooring estimate today! When trying to decide which choice of flooring would be the best to suit your home’s needs, incorporating epoxy flooring into your design might just be a choice you would otherwise overlook. ​ It can be so versatile to your home’s look if you choose the right method that fits your style, budget and needs. With so many options and ways to make it your own, you can begin to see epoxy floors in a whole new light. 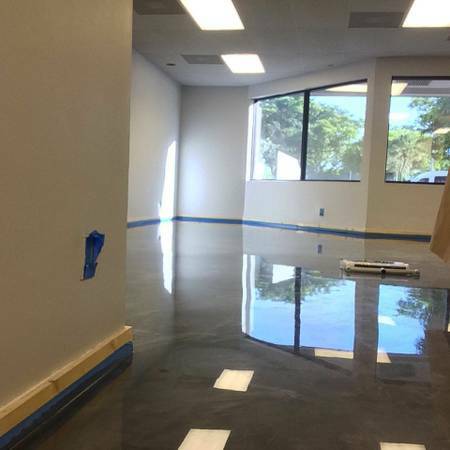 Not only will you find epoxy floors in more typical places that come to mind, like vehicle showroom floors, pool walkways and other industrial areas, but concrete flooring isn’t just for areas that take a beating! It can be incorporated into the interior of your home design. For example, if you or someone in your family suffers from frequent or seasonal allergies, you can replace your home’s flooring with that of stained concrete. From there, you can make design choices that can incorporate color, prints and design! When you finish the basics, you can then cover it with Epoxy. This will leave your home’s floors with a finished, clean look that will add a sheer finish to your floors and it will make your home look fresh and contemporary. A “plus-up” to choosing epoxy flooring is that when you choose to use it, you are saving on the additional expenses of adding carpeting or hardwood, and those costs that are associated with the installation of them. When you choose to use a material that is so readily available when the home is constructed, you are saving yourself time, money and opening yourself to so many options in how you might choose to create the overall finished look of your home. Another popular way to incorporate epoxy flooring into your home is typically seen in ‘Man-Caves’ and finished garages. Garage floors that are covered with custom paint and epoxy are very popular in these areas, as they are easy to clean up after and require little to no maintenance. When a spill happens in a ‘Man-Cave’ it can be simply cleaned up with a few wipes with a cloth or rag. The same can be said when working in a finished garage, where it might be easier to hose down the finished floor and allow it to air dry. It shouldn’t come as a surprise to know that the widely popular usage of these types of floors can facilitate adding in special touches, such as your favorite football team to be painted on the floor, or a checkboard floor in a garage that doubles as a show floor in your home. Additionally, using epoxy finish on a garage floor will save the concrete from spills like oil or grease, as concrete is very porous and can ruin the look of the it, when left unprotected. Other popular places you might see painted, epoxy covered concrete flooring would be in an industrial setting, like a factory, hospitals, veterinary offices or even a warehouse. With the ability to maintain easy cleanup and keep maintenance down to a minimum, it should be easy to see why so many businesses might choose to use that flooring over any other type. Floors that can take a heavy hit daily, that are also LOW maintenance, are worth their weight in gold, for a business. Not having to readdress the need to renovate floors every few years is one less burden to have to deal with when you own a business. It is also very common that you might notice this type of flooring on showroom floors of Automotive Dealerships. Typically, they use this type of flooring for ease of cleaning before and after the movement of vehicles in and around the showroom floor. Popular entertainment places, like swimming pools can benefit from the usage of concrete floors which has been painted and epoxied. Using these materials around areas like this that are slick can help to prevent falls and keep the area tidy. When you incorporate an epoxy based flooring around a pool deck, it creates a non-skid surface to keep swimmers and those near the pool safe. Epoxy flooring is durable, very affordable and can be aesthetically pleasing when you create a custom look that you can truly call your own. DIY homeowners are encouraged to do their homework and research to ensure they are comfortable with installing an epoxy floor on their own. Attending home installation classes offered by your local home do-it center or Big Box Store can help you with the questions you may have, and might even show you a few pointers! 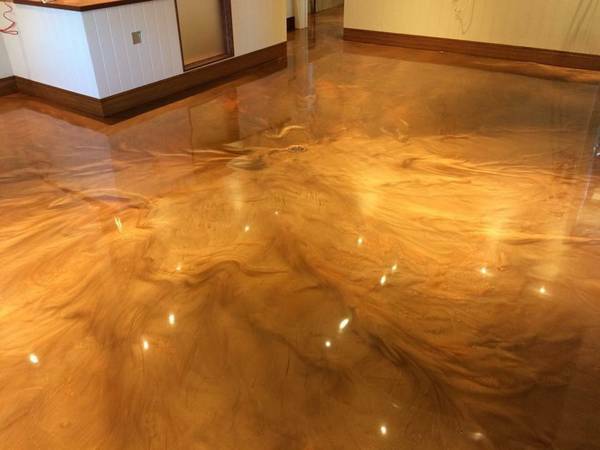 Whenever you are not 100% sure of what you are doing, with a Epoxy floor project, or any other for that matter, it is always a good idea to seek out someone who has either done this in their home, successfully, or have the epoxy professionally installed. This will alleviate costly do-overs and expensive fixes when things don’t go as planned.